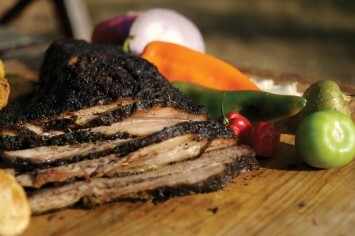 Tender and succulent beef brisket is a real treat if it is cooked properly. This oven baked brisket recipe shows you how to cook brisket so it turns out perfectly each and every time. To make the rub, combine the chili powder, salt, garlic powder, onion powder, pepper, sugar, mustard, and bay leaf in a small bowl, and mix thoroughly. Season the brisket on both sides with the rub. 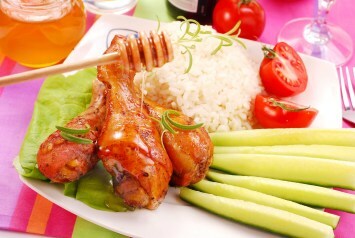 Place in a roasting pan or Dutch oven and roast uncovered for 1 hour. Add the beef stock or broth and enough water so that there’s about 1/2 inch of liquid in the pan. Cover tightly with heavy foil (or the lid, if using a Dutch oven), decrease the oven temperature to 300ºF, and continue cooking for 3 hours or until fork-tender. Slice the meat thinly across the grain. Top with the juices from the pan. This recipe suits low carb and gluten free diets (make sure your stock is gluten free) and is a very good diabetic recipe too. This recipe is from one of my favorite cookbooks, Cooking the Cowboy Way: Recipes Inspired by Campfires, Chuck Wagons, and Ranch Kitchens by Grady Spears and June Naylor. Grady has cooked in cowboy kitchens for many years and knows how they like their food. He brings a wealth of great taste to all of his recipes. Try a brisket sandwich – place a pile of sliced brisket on rye bread or fresh crusty bread and slather on the mustard. Serve it with a side of cole slaw and enjoy. Love this brisket? You will want to try Brown Sugar–Crusted Porterhouse Pork Chops with Apple Walnut Slaw, another recipe from this terrific cookbook. OMG, I reduced the salt to just half as much. I used two soup cubes to make the stock then added 1 Tablespoon of Cayenne pepper. It is just awesome. Nice heat, super soft and juicy. Nice suggestions Mike. Glad you like the recipe. Keep cooking!